This project was a collaboration between Merlin Entertainments, choreographer Jodie Blemings, 18 dance company members from Chrysalis London, costume designer Laura Albeck and composer DJ Walde. The dance performance was staged at Sea Life London Aquarium as part of their opening event for the jellyfish-themed exhibition Ocean Invaders. 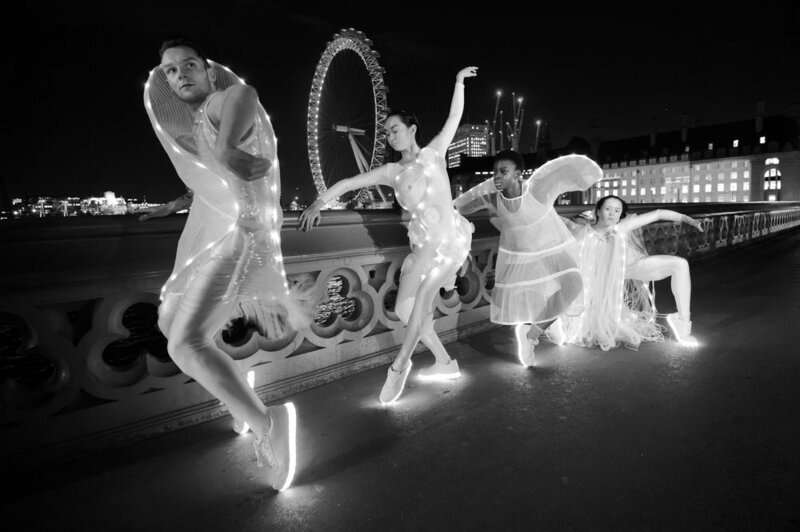 LED-based lighting was incorporated into the majority of the costumes as the performance was planned to happen outdoor at Southbank in the evening, accompanied by projection design cast onto building facades as the primary light source. The use of LED lighting moreover alluded to the bioluminescence and wide colour gamut of jellyfish. The 18 costumes aimed to function as a cohesive collection with numerous self-referential details while making use of archetypal jellyfish shapes and elements in a non-literal way – referencing what in our common understanding defines jellyfish. Some of the designs are oversized to expand the physical sphere of the dancer and allow for exploration of bodily space. As the costumes were to be seen from multiple viewpoints, the designs ultimately aimed to show the jellyfish as they are in the sea – suspended and floating in water. Plastic-based materials have been a recurrent theme in most of the costumes, both for their translucent, water-like qualities and as a very indirect reference to sea pollution.